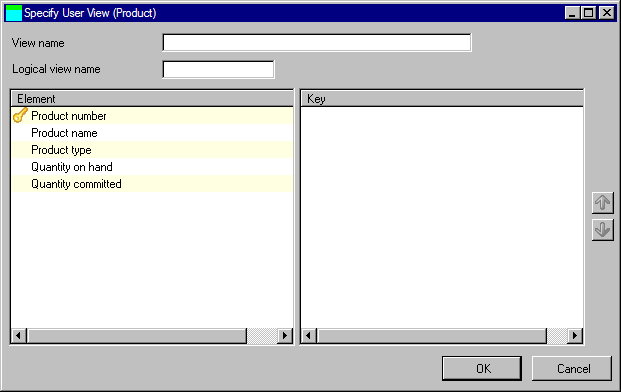 In this step, you will create a user view for the Product Entity, sequenced by Product Name. 2. Select the Product Entity by clicking on its diagram shape. 3. Display the Maintain User Views window by selecting the Edit menu and choosing the User Views… option, or right-click the entity and select the User Views… option from the pop-up menu. A new user view can be created and existing user views can be changed and deleted. 4. To create a new user view, click the New toolbar button. 5. At the top of the window, a view name must be specified. On the left pane of the window is a list of all elements within the entity. This includes elements that have been inherited by the entity as the result of relationships with other entities. On the right pane of the window is a list that contains the elements that make up the view. These are known as the view's key. 6. Enter a View Name of By Product Name. 7. Enter a Logical View Name of iiiPRDNM, where iii are your initials. 8. Add the Product Name element to the view's key by double-clicking it in the Element list ,or by dragging it from the Element list to the Key list. Note that when an element is added to the Key list, it is removed from the Element list. Double-clicking an element in the Key list or dragging it to the Element list will remove it from the Key list and add it back into the Element list. Note that when the entity is built, the user view will be transformed into a logical file that implements the key that you have specified here. 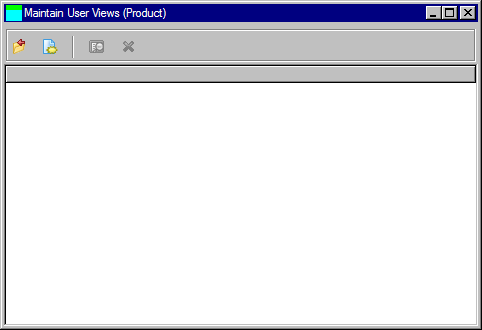 The view name will be displayed in the list of user views. A user view can be changed by selecting it in the list and clicking the Change toolbar button. A user view can be deleted by selecting it in the list and clicking the Delete toolbar button. 10.Close the Maintain User Views window by clicking the Close toolbar button.